Do You Recognize These 6 Vintage Cooking Gadgets? One model introduced to the US in 1907 is even still in production today. We’ve seen our share of strange (or innovative, depending on your point of view) modern gadgets here at Cook’s Illustrated, from a citrus spritzer you stick into a piece of fruit to a Mason jar drinking lid. But we’ve also encountered some antique and vintage gadgets that we’ve taken to task in our test kitchen. Here are 6 that worked particularly well, especially given their age. This old appliance is a Universal Bread Maker made by Landers, Frary & Clark of New Britain, Connecticut—its patents date back to 1900. Unlike contemporary bread makers, which take care of all aspects from mixing to baking, this only serves as a mixer and proofing box. 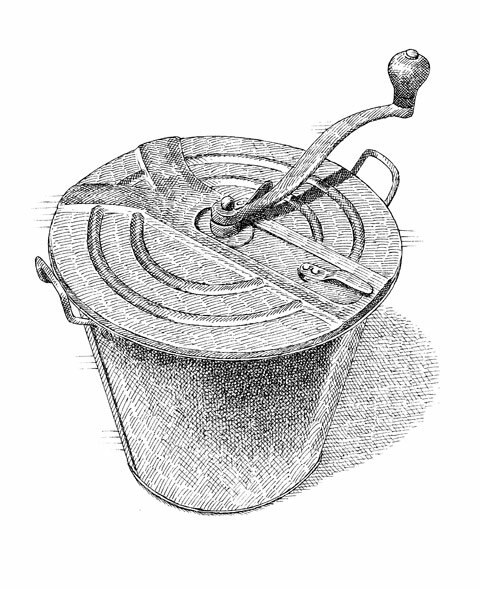 The tin device has a deep pail to hold the flour, yeast, and water; a dough hook that attaches to a crossbar secured to either side of the pail; and a lid. The lid bears stenciled instructions that call for putting “all liquid ingredients in first, then flour.” It also tells the user to crank the handle (to turn the dough hook and knead the bread) for three minutes. When we followed the instructions the results were pretty good, though we did have sore arms from turning the handle. 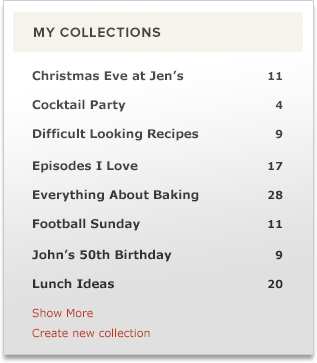 The only other drawback was that we had to triple the recipe so the dough hook could reach all the ingredients. 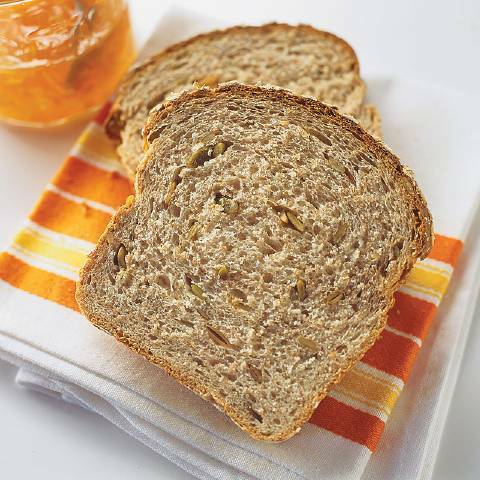 RECIPE FOR MEMBERS: You don’t need a Universal Bread Maker to bake our Multigrain Bread, a loaf packed with wheaty flavor and balanced texture. 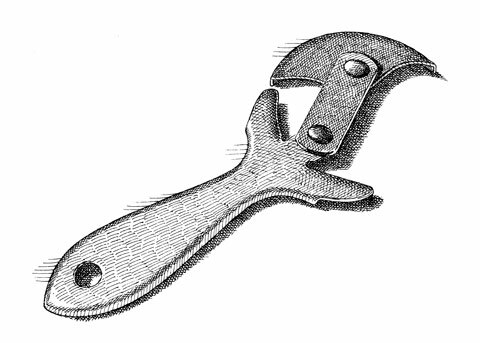 This jar opener comes from Geneva, Ohio, around the 1920s or 1930s. 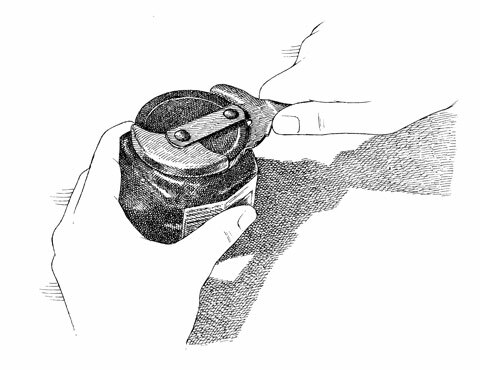 Manufactured by the Champion Hardware Co., it was designed to help loosen the lids of small containers like jelly or mustard jars (or any jar with a diameter of 2.5 inches or less). 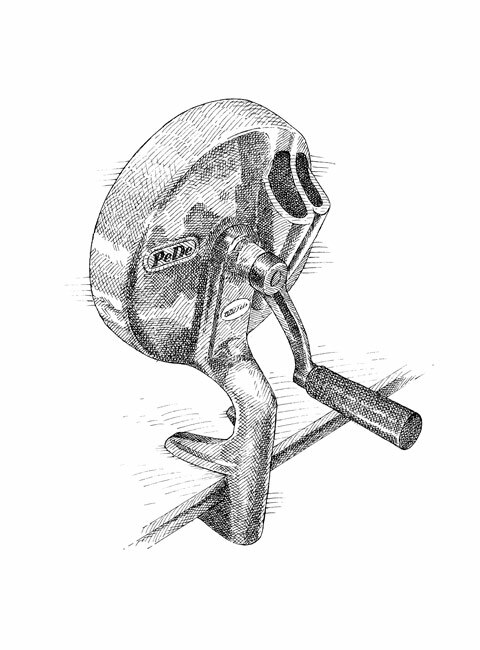 The jaws of this tool are serrated to gain traction on lids, and they open and close with the aid of a double pivot pin. 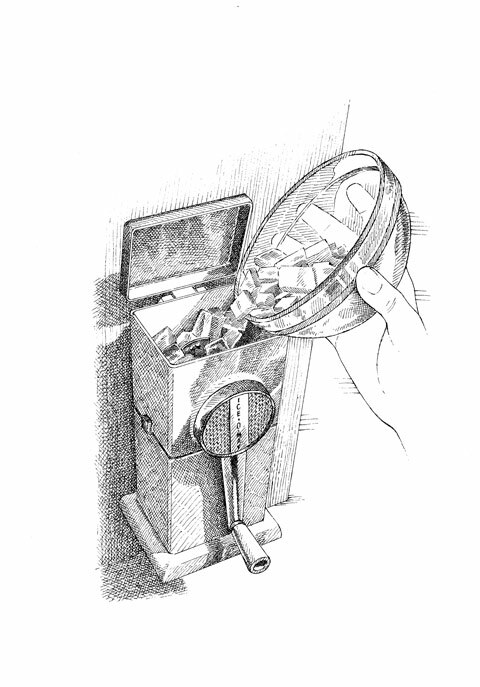 Despite its age, we found this gadget quite effective for opening stuck lids when we tried it out. 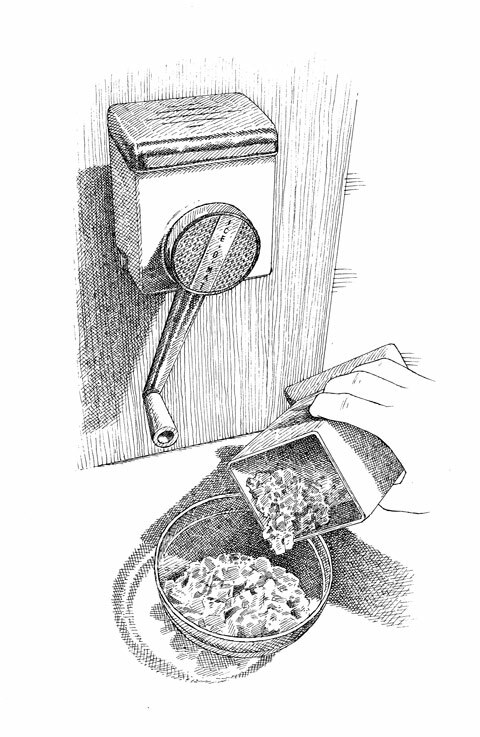 RECIPE FOR MEMBERS: If you buy jarred pasta sauce often, you’ll probably need a jar opener. 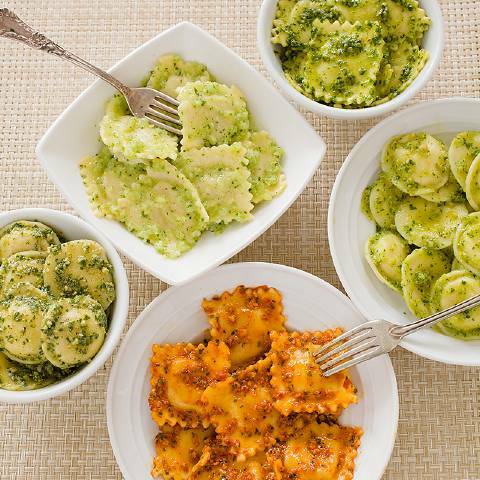 But when recipes are as easy as our Roasted Red Pepper and Pistachio Pesto for Cheese Ravioli, we suggest you forgo the jar and make your own sauce instead. 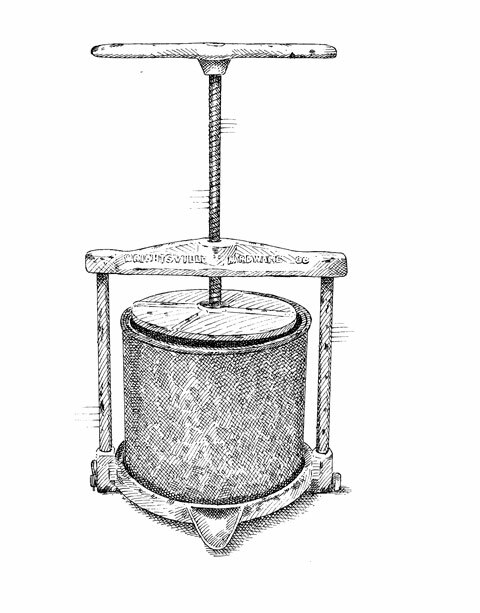 This is an old fruit and lard press from the late 1800s made by the Wrightsville Hardware Co. of Wrightsville, Pennsylvania. It consists of a perforated basket that sits inside a large 6-cup cylinder, featuring a cast-iron metal plate attached to a vertical screw and hand crank that compresses the ingredients when the handle turns. 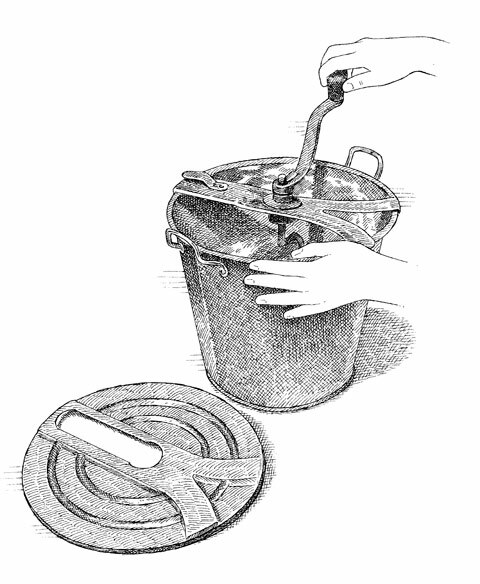 A spout on the bottom of the unit directs the flow of the liquid. 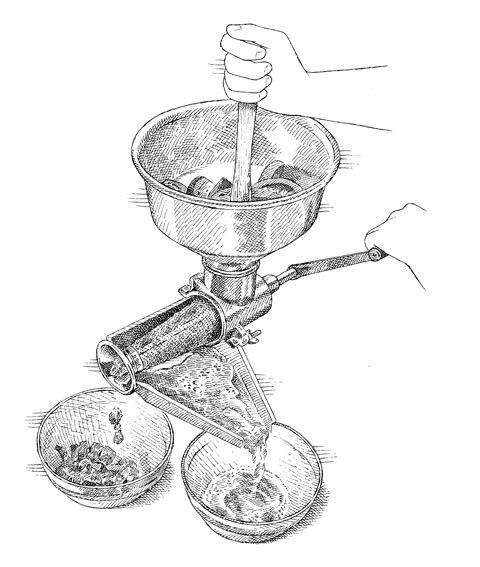 This device was a real multi-tasker in the kitchen, used both for extracting the juice from fresh fruit for preserves and squeezing oil from the crackling that remained in rendered lard. We found that this press does a fine job of squeezing juice from blueberries and raspberries. 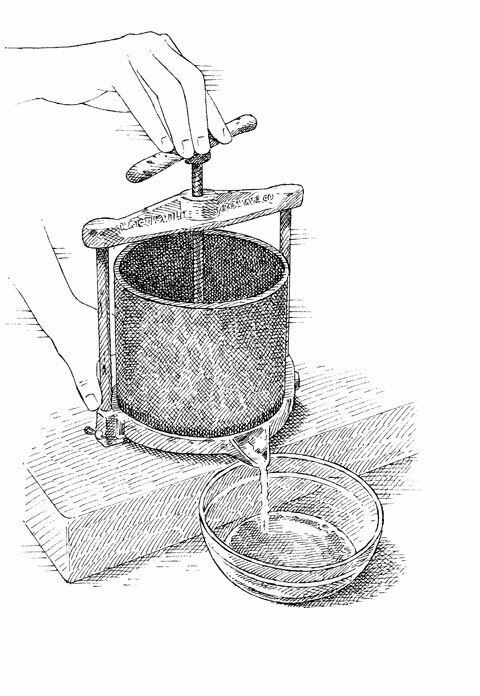 And since the need to press lard from cracklings doesn’t often arise in modern kitchens, we employed it for another reported use: cheese making. When we used it to wring whey from fresh cheese curds for paneer, an Indian cheese, the press worked like a dream and was easy to clean, too. 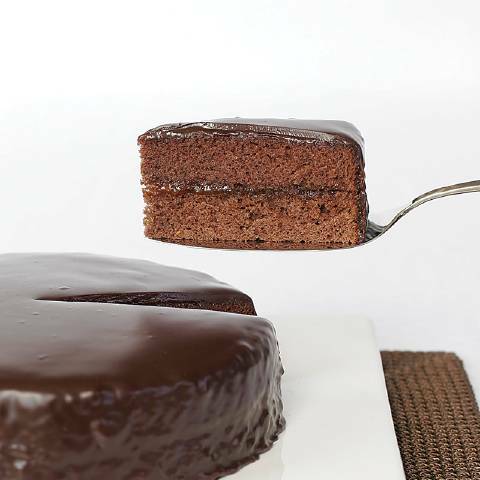 RECIPE FOR MEMBERS: Since this tool can be used for making fruit preserves, we were inspired to make our Sacher Torte, a rich chocolate cake with a ribbon of apricot jam in the middle. This contraption is a 1950s Ice-O-Matic ice crusher made by Rival. It was designed to be attached to the wall of a kitchen or bar, and we were able to find a number of them for sale online. We used the hand crank of the Ice-O-Matic to crush 10 pounds of ice, and while it was labor intensive, the ice ended up more uniform in size and less fine than the ice shavings from a refrigerator crusher. We aren’t ready to give up the convenience of our refrigerator ice crusher for this gadget, but if were were to set up a retro-style bar, the Ice-O-Matic would be at the top of the list. 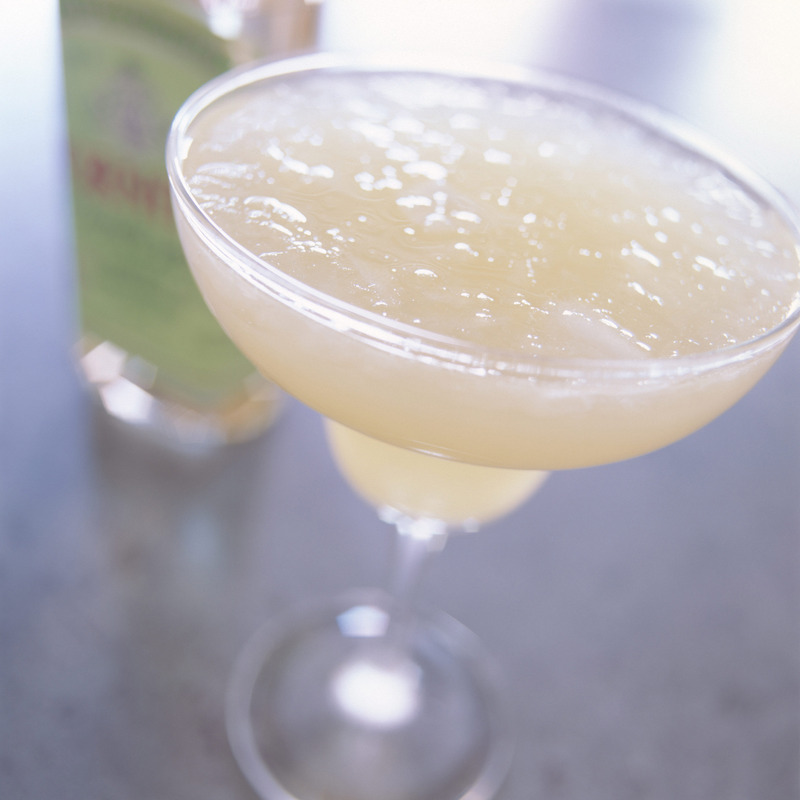 RECIPE FOR MEMBERS: No matter how you crush the ice, it tastes fantastic in a Fresh Margarita. Finding out what this machine did was elusive; it took us weeks of paging through antique catalogs and searching online markets before we finally identified it as a double-feed green-bean slicer. Made by the Peter Dienes company, it was manufactured in Holland during the 1950s. To use it, the bottom is affixed to a countertop or a heavy-duty cutting board. 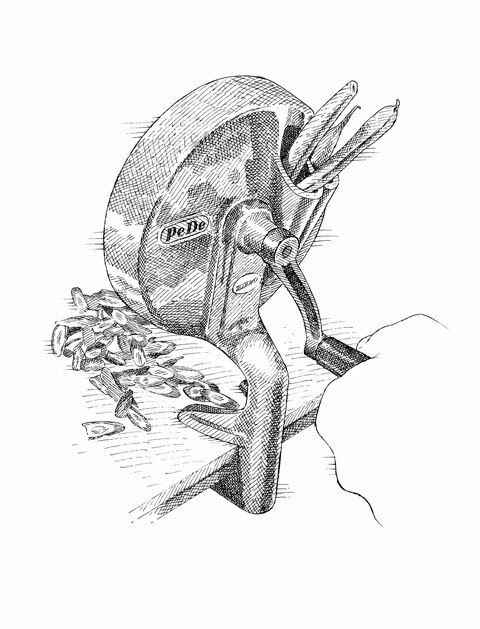 Each of the two chutes accommodates two green beans; with a few turns of the handle, a blade cuts them on the bias into 1-inch long, 1/16-inch thick slices. The paper-thin cut makes tougher green beans taste less fibrous. But how does it compare to a knife? It took us five minutes to cut 1 pound of green means into uniform, ultrathin cuts using the slicer and over 15 minutes to cut far less precise slices with a knife. So if you were faced with a mountain of green beans in times past, this old tool might very well have become your best friend. 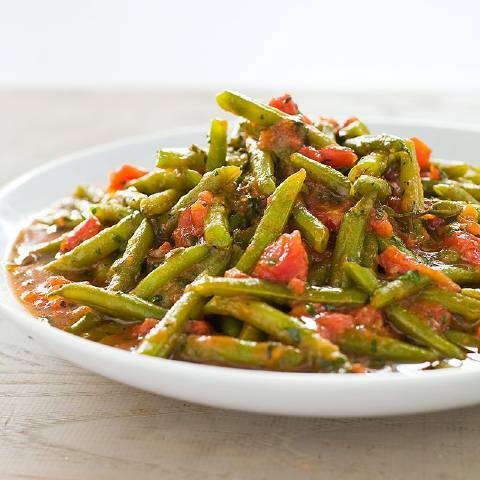 RECIPE FOR MEMBERS: While it doesn’t call for paper-thin slices, our recipe for Mediterranean Braised Green Beans is a savory, deeply flavored side dish. This gadget dates back all the way to 1907, when an Italian immigrant, Anthony Berarducci, brought sketches of the hand-cranked milling machine to America. Twelve years later, he began manufacturing the tool himself. The device quickly prepares fresh or steamed fruits and vegetables for sauces and purees. Whole produce is places in the 2 1/2-quart hopper, and with gentle pressure from the plunger and a few turns of the handle, juice and pulp flow down the ramp into a bowl. Unlike a food mill, which collects skins and seed in its hopper that must be cleaned between batches, the Squeezo conveniently expels waste into a separate container. Interested in owning one? You can: Squeezo strainers are still manufactured today and are available for around $200 on Amazon. RECIPE FOR MEMBERS: Our Shrimp Fra Diavolo uses coarsely pureed tomatoes—a potato masher does the job as well. 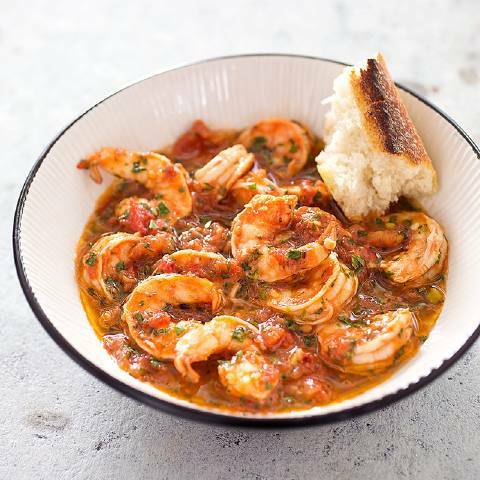 Ours is a lively and piquant dish, with tangy tomatoes countering briny, plump shrimp, and pepper flakes and garlic providing a spirited kick. We found one opener that could open anything from a small bottle of vanilla to a quart-sized jar of pasta sauce.